What is involved in becoming a therapy animal team? Complete a local therapy animal training course. Complete the Pet Partners® registration process. Fill out the North Star Therapy Animals application. Can only dogs be therapy animals? No. Although dogs are the most common therapy animals, cats, rabbits, guinea pigs, horses, and birds can also be therapy animals. Would my animal make a good therapy animal? The most important characteristic of a therapy animal is its temperament. A good therapy animal must be friendly, patient, confident, gentle, and at ease in all situations. Therapy animals must enjoy human contact and be content to be petted and handled, sometimes clumsily. Do only certain types of dogs make good therapy animals? No. 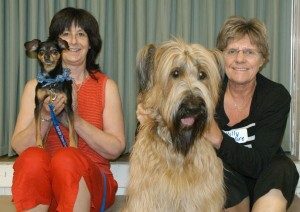 Therapy dogs come in all sizes and breeds. No. Service animals are defined as dogs that are individually trained to do work or perform tasks for people with disabilities. Examples of such work or tasks include guiding people who are blind, alerting people who are deaf, pulling a wheelchair, alerting and protecting a person who is having a seizure, reminding a person with mental illness to take prescribed medications, calming a person with Post Traumatic Stress Disorder (PTSD) during an anxiety attack, or performing other duties. Service animals are working animals, not pets. The work or task a dog has been trained to provide must be directly related to the person’s disability. Dogs whose sole function is to provide comfort or emotional support do not qualify as service animals under the ADA. A therapy dog is a dog trained to provide affection and comfort to people in hospitals, retirement homes, nursing homes, schools, people with learning difficulties, and stressful situations, such as disaster areas. 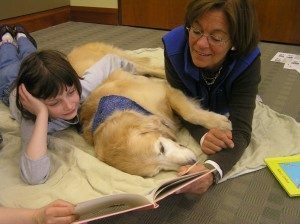 A therapy dog’s primary job is to allow unfamiliar people to make physical contact with it and to enjoy that contact. Children in particular enjoy hugging animals; adults usually enjoy simply petting the dog. The dog might need to be lifted onto, or climb onto, an individual’s lap or bed and sit or lie comfortably there. Many dogs contribute to the visiting experience by performing small tricks for their audience or by playing carefully structured games. There are three easy steps to joining us. Your first step is to complete a local therapy animal training course. Although we don’t currently offer training classes, we can easily put you in touch with training facilities that do. We can also help you schedule an evaluation if you are at that point in your training. 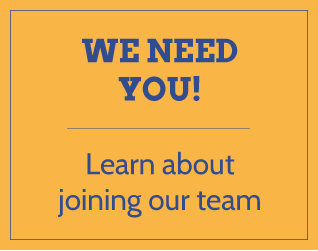 Whether you’re interested in becoming a team, volunteering as an individual, having a team visit your facility, or supporting us financially, we’d love to hear from you!